Greek or Turkish Biblical commentator and liturgical poet of the fifteenth century; maternal grandfather of Menahem ben Moses Tamar. According to the latter ("Tanḥumot El," ch. x. 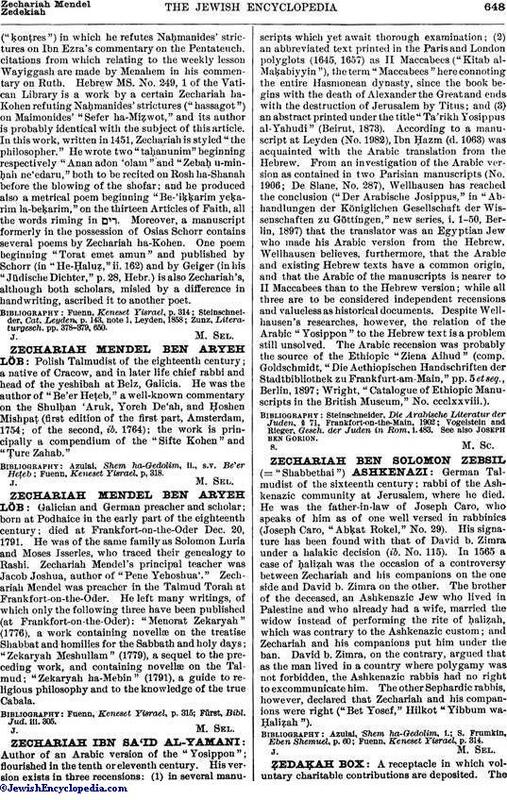 ), Zechariah wrote a pamphlet("ḳonṭres") in which he refutes Naḥmanides' strictures on Ibn Ezra's commentary on the Pentateuch, citations from which relating to the weekly lesson Wayiggash are made by Menahem in his commentary on Ruth. Hebrew MS. No. 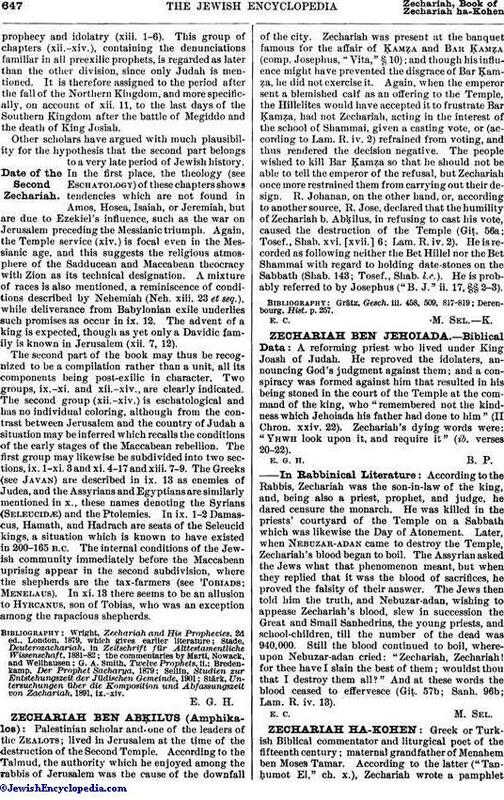 249, 1 of the Vatican Library is a work by a certain Zechariah ha-Kohen refuting Naḥmanides' strictures ("hassagot") on Maimonides' "Sefer ha-Miẓwot," and its author is probably identical with the subject of this article. In this work, written in 1451, Zechariah is styled "the philosopher." He wrote two "taḥanunim" beginning respectively "Anan adon 'olam" and "Zebaḥ u-minḥah ne'edaru," both to be recited on Rosh ha-Shanah before the blowing of the shofar; and he produced also a metrical poem beginning "Be-'iḳḳarim yeḳarim la-beḳarim," on the thirteen Articles of Faith, all the words riming in . Moreover, a manuscript formerly in the possession of Osias Schorr contains several poems by Zechariah ha-Kohen. One poem beginning "Torat emet amun" and published by Schorr (in "He-Ḥaluẓ," ii. 162) and by Geiger (in his "Jüdische Dichter," p. 28, Hebr.) is also Zechariah's, although both scholars, misled by a difference in handwriting, ascribed it to another poet. Zunz, Literaturgesch. pp. 378-379, 650.